Sorry, but we are unable to accept reservations via this website. Please call Kozmo's Grille at 330-832-8807 during business hours to request a reservation. 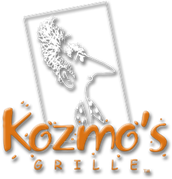 THANK YOU for your interest in Kozmo's Grille!